When Sicilian singer, deejay, producer and multi-instrumentalist “roots renaissance man” Alborosie burst out with a slew of peerlessly consistent singles in 2006, it seemed like an unstoppable reggae force had come from nowhere. In reality his sound had been in genesis for over a decade: formulating in Italy as part of the group Reggae National Tickets and consolidating with a relocation to Jamaica to study the culture, the hustle and the craft he loved. As you’d expect from a man unafraid to take the road less trod, Alborosie’s subsequent albums have woven their own curious path. So far so to plan was the story of 2008’s Soul Pirate – a collection of said singles and other tracks that was more compilation than album. By 2009 follow-up Escape from Babylon, both the compression levels and the lyrics had become heavier – as if the burden of being an international outsider had become wearying. “I don’t hate nobody or maybe I hate myself. So let me waste my time and let me waste myself” he chanted to critics during I Rusalem. 2011’s 2 Times Revolution suggested a different kind of restlessness – making musical forays into hip hop and Latin music. 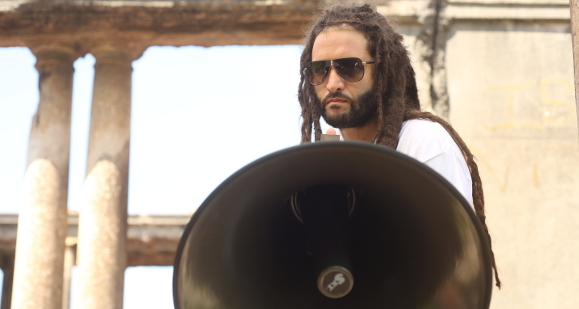 His fourth vocal album Sound The System was announced before its July 2013 release as “300% roots”. Certainly it marks a return to the lyrical creativity of the Soul Pirate era. It has also seen a reinvigoration of his live shows. Now he has issued its companion Dub the System on vinyl LP only. Angus Taylor caught up with the man behind the myth in July as he was quietly celebrating at home in Jamaica. When we first interviewed him back in 2008 he seemed shy and his non-Jamaican English was basic. Many interviews later he had no problems expressing himself on a wide variety of topics from his 20th anniversary in reggae to the roots resurgence in Jamaica to the politics of catching fish…. So far so good. Relaxing now. Today is a day off – my birthday. Thank you very much my brother. Well the best way is just to relax. So I’m just relaxing and chilling. Away from the crowd. Would you say you have a heavy work schedule in general? Oh yes, yes. I’m a hardworking person. When I don’t perform, I’m in the studio. To tell you the truth the past two years I have decided to slow down a little bit. I’ve been always dedicating my life to music and now it’s time to spend some quality time with my family in Jamaica. You announced on your Facebook and Twitter that this album was “300% roots music” – did you feel a more roots album is something your fans want to hear? I don’t really watch people like that. I do what I like and I know that what I like is where I want to be and where I want to go. But one thing I can tell is I’m always faithful to reggae music. Because reggae it is a journey to me from day one and it’s still a journey so I want to be faithful to my journey and my mission. But if one day I do something that people aren’t going to like, at the end of the day I’m still Alborosie – I’m still myself, so there is no problem. Do you listen to what critics say? No. Maybe you can help me out – what do critics say about me? I’m too busy to read other critics! But your last vocal album 2 Times Revolution was your most diverse musically whereas this album does seem to be in a traditional classical roots reggae mode for the most part. I believe it’s a little bit too early for reviews because the album came out July 1st. But the critics on Facebook have been great. Everybody loves the album. The album is powerful. Personally it is a good reggae album and I’m proud to say to you that I’m working to keep my roots reggae music alive. Because reggae music needs it right now – some good roots music.